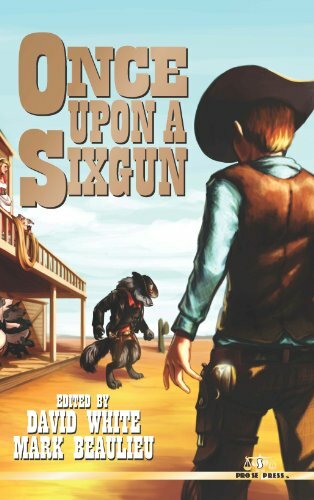 Pro Se Productions, a cutting edge Publisher of Genre Fiction and New Pulp, announces that its latest anthology, ONCE UPON A SIXGUN, is now available as an Ebook. From penny dreadfuls turning Billy the Kid into a hero to stories of Big Bad Wolves eating Grandmothers. Pro Se Productions asks the question…what if that fictional land of creatures and beasties and that very real time in American history were one and the same place? ONCE UPON A SIXGUN is the answer to that question! Ride with Authors Lee Houston, Jr., Nikki Nelson-Hicks, Mark Gelineau, and Joseph King as they saddle up and, with a little fairy dust and luck, take you on adventures never before imagined! Two of the most popular genres ever come together in rollicking adventure yarns that would curl a cowpoke’s mustache in any Enchanted forest! Featuring a wonderfully fun cover by Kathryn Frizzell and ebook formatting by Russ Anderson, ONCE UPON A SIXGUN is available as an Ebook at Amazon, Barnes and Noble, and www.Smashwords.com for $2.99. For digital review copies, to interview the authors, or for more information on this title, contact Pro Se’s Director of Corporate Operations, Morgan Minor, at directorofcorporateoperations@prose-press.com.